Skid shoes increase the life of the cutting edges on the land planes while avoiding damage to the working surface. The skid shoes are adjustable up and down on each side plate to allow for the creation of a crown on a road for water runoff. 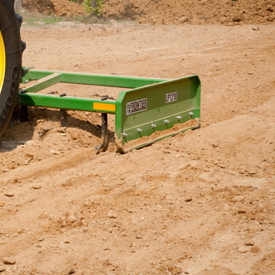 By replacing the skid shoes when needed, it will extend the life of the land plane. 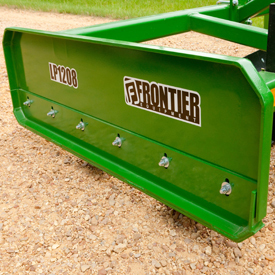 Scarifier shanks on the front frame will rip up hard ground pans, and they work well for aggressive grading and leveling. The scarifier shanks can be easily adjusted for depth control. 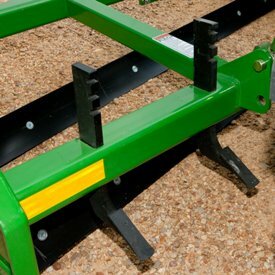 Scarifier kit for the LP1207, LP1208, and LP1210 Land Planes are used to loosen up compact ground when performing general leveling and grading duties.